Universal, high throughput screening assays for enzymes using direct detection of nucleotides and homogenous fluorescent readouts. Assays for Thousands of Targets. Transcreener assays rely on direct immunodetection of nucleotides, which is less susceptible to interference than complicated enzyme-coupled assay schemes. Four types of Transcreener nucleotide detection assays enable you to screen thousands of target enzymes faster and more efficiently. Your choice of FP, FI and TR-FRET readouts; all with far red fluors and certified performance on major multimode readers. Homogenous, mix and read format can be used for endpoint assays or for continuous monitoring of enzyme activity. Overnight reagent and signal stability means reliable, robust screening data in large automated screens. Transcreener is a universal assay method that can be used across entire families of nucleotide-dependent enzymes. Rather than using separate assays for a multitude of specific reaction products, such as phosphorylated proteins or lipids, a single nucleotide detection assay can be used for all of the enzymes that generate a common nucleotide product. 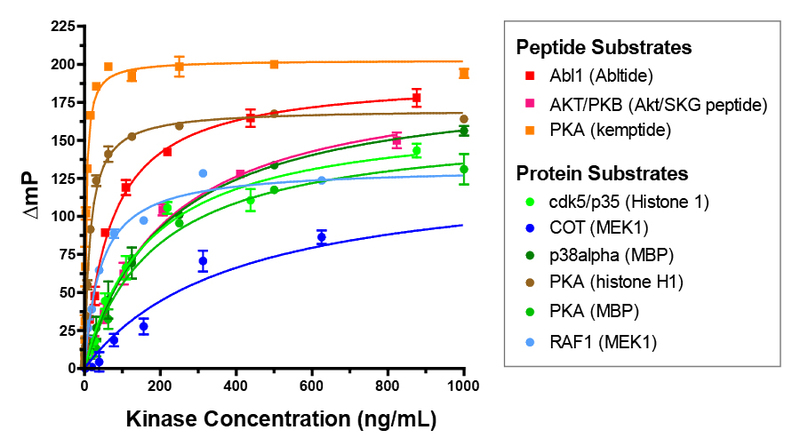 For example, ADP detection can be used as a universal kinase assay method for any protein, lipid or carbohydrate kinase. Transcreener assays rely on direct, highly specific detection of nucleotides using antibodies that are able to differentiate between nucleotides on the basis of a single phosphate group. Selectivities for the product nucleotides vs. the substrates (e.g., ADP vs. ATP for a kinase assay) range from 150-fold to over 1000-fold. This exquisite selectivity allows detection of nucleotide enzyme products in the presence of an excess of the substrate nucleotide (e.g, ADP detection in the presence of excess ATP for kinase assays), a requirement for measuring enzyme initial velocity. To generate a signal, the Transcreener Assays use a homogenous, competitive immunoassay format in which the antibodies are paired with high-affinity fluorescent tracers. Displacement of the tracer by the nucleotide being detected causes a change in its fluorescence properties. The FP assay is the simplest; it requires just the tracer and the unmodified antibody; the change in polarization is caused by the increased rotational mobility of the tracer when it is displaced. For the TR-FRET and FI formats, the antibody is conjugated with a molecule that changes the magnitude of the tracer fluorescence when it is bound, and this effect is lost when the tracer is displaced. 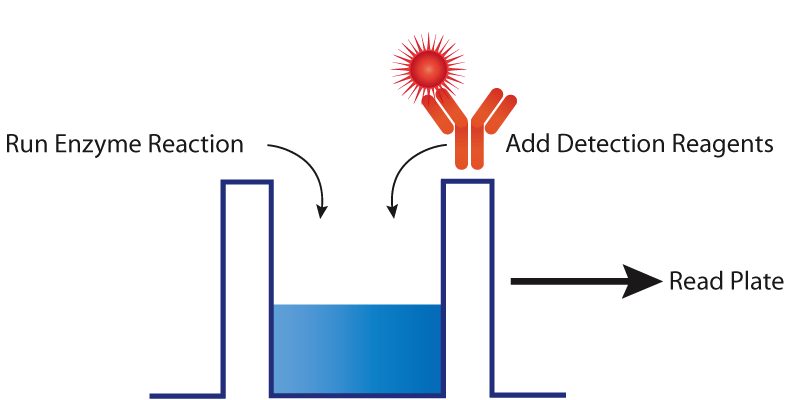 Direct detection also means that the protocol is the simplest and most flexible available: run your enzyme reaction, add Transcreener reagents with stop mix, and read plates. Or the Transcreener detection reagents can be added at the start of the enzyme reaction to continuously monitor enzyme activity; e.g., for measuring inhibitor residence times with “jump dilution” kinase assays. Some coupled methods require extra liquid addition and incubation steps, which complicates assay automation and precludes running them in a continuous mode. 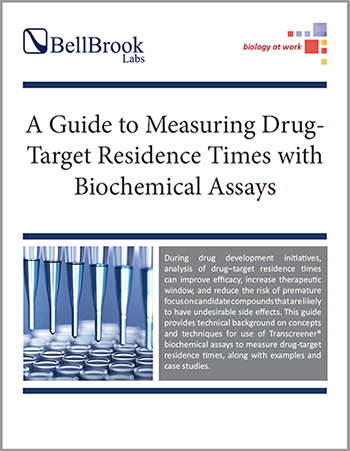 Learn how to determine drug-target residence times and improve your lead discovery with this 12-page guide! All of the Transcreener antibodies and tracers and the assay signals are stable at room temperature for at least 8 hours. This ensures that data quality does not suffer even in large, automated screens, where the detection mix may be stored in a dispensing deck for long periods at room temperature. Other nucleotide detection assays have much more stringent post-thaw storage requirements because of the lability of the coupling enzymes. Also, unlike the transient signals from some coupled enzyme assays, the Transcreener fluorescent signals persist at least overnight – some for days – so plates can be read long after the detection reagents are added. The outstanding reagent and signal stability make Transcreener assays very reliable and easy to use in an automated HTS environment. Thousands of cellular reactions use nucleotides, including most of the enzymes that catalyze posttranslational modifications of proteins such as phosphorylation and methylation. Because of their central role in signal transduction, many PTM enzymes have become drug targets. 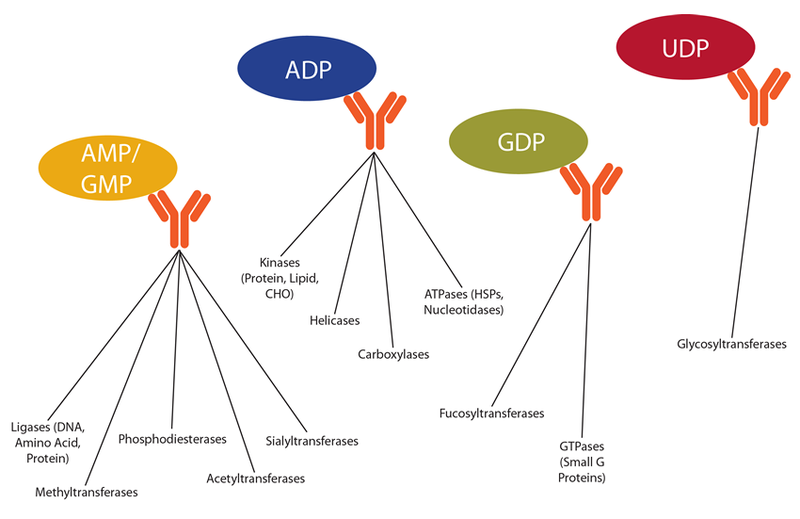 Though protein kinases get the most attention, acetyltransferases, methyltransferases, and glycosyltransferases are also clinically validated targets, and many more PTM-related drugs are in the pipeline. Transcreener assays were developed to enable HTS efforts targeting PTM enzymes, as well as other types of nucleotide-dependent enzymes, including ATPases, GTPases, and phosphodiesterases. Transcreener Assays were developed and continuously improved for use in an industrial HTS setting. Since their introduction in 2006, they have been used worldwide in over 60M wells of inhibitor screening, profiling and mechanistic studies in 96, 384 or 1536 well plates with all of the major multimode plate readers. Use of ADP detection for kinase assays accounts for more than half of those wells, and most of these users decided on Transcreener after comparing it to alternative assay methods. For many more atypical targets – glycosyltransferases, helicases, carboxylases, GTPases, ligases, to name a few – there are no good alternatives, and Transcreener has been a truly enabling technology. The screen would likely not have gone forward without it. Regardless of the target, all of the Transcreener assays generate Z’ values of greater than 0.7 at substrate conversion levels of less than 10% – usually far lower – over the full range of initial substrate concentration. They are largely unaffected by most reagents used in enzyme assays, and the signals are rock solid at least overnight. We have collaborated with the major multimode instrument providers including Tecan, BMG, Biotek and Molecular Devices to optimize instrument hardware and software settings for maximal performance with each of the Transcreener Assays. Optimal filter sets and instrument settings are summarized in the Technical Manual for each Transcreener assay, and more detailed information is available in Application Notes. This ensures that whatever fluorescent detection mode or reader you prefer, you will get robust results with Transcreener assay reagents.